that I find myself explaining how a tree or plant grows. Many gardeners and bonsaists do not have a working knowledge of botany as it pertains to our hobby. For this reason, I am launching a Botany Basics column. I will attempt to explain how trees and plants work and what affects them. These columns will appear as space in the newsletter permits. What uncanny sense of direction do roots and stems have when one tunnels through the soil in search of water and nutrients while the other lifts leaves up to the sunlight? At predictable times of the year, many species flower in response to specific day and night lengths. Do plants count the passing hours? Why does branching occur when branch tips are removed? Encouraging gardeners to prune plants in order to stimulate growth seems contrary to all reason. What leads deciduous trees to shed their leaves in fall and awaken from sleep each spring? There is no end to questions on how plants function. To begin, we need to establish a common vocabulary so we will all speak the same language. Today I will name the parts of trees and their functions. Leaves produce food for the tree, and release water and oxygen into the atmosphere. Chloroplasts are the chlorophyll bodies within the cells of leaves in which photosynthesis takes place in order to manufacture carbohydrates (starches and sugars) for the tree. They give the green color to leaves. The trunk is the main support of the tree to better expose leaves to the sun. Bark is the “skin” of the tree and provides an external protective layer. Inner bark (Phloem) located just under the bark , is part of the circulatory system, carrying compounds manufactured in the leaves, down throughout the tree where needed. The cambium is a layer only a single cell thick between the inner bark (phloem) and the sapwood (xylem). It produces the cells that allow both the phloem and xylem to grow. The sapwood (xylem) is produced by the cambium and carries water and nutrients up from the roots to the leaves. The heartwood is essentially inactive sapwood. It gives the tree strength and rigidity, and serves as a depository for stored food and wastes. Main branches (scaffold branches) are the large limbs on the trunk that give the tree it’s basic shape and structure. Secondary branches (lateral branches) are mainly horizontal on the main branches that create the outline of the tree. Tertiary branches (twigs) on the secondary branches have the leaves. The root system can be quite extensive depending primarily on soil texture and depth. Availability of moisture and nutrients also affect the extent of the root system. Some trees may have an initial taproot, but as the tree grows, other more horizontally growing roots predominate. It serves as the initial anchor for the tree. Lateral roots develop from the base of the trunk and spread, forming an extensive network that serves to anchor the tree. They also provide storage for carbohydrates. Feeder roots grow from the lateral roots and serve to transport water and nutrients absorbed by the root hairs. They tend to be concentrated within the “dripline” (where the rain drips off the tree canopy), but may extend great distances if searching for adequate moisture and nutrients. Root hairs are microscopic appendages to the feeder roots that along with a symbiotic relationship with mycorrhiza, absorb water and nutrients the tree needs in order to live and grow. Mycorrhiza was covered extensively in previous newsletters. In summary, The root system collects water and nutrients that are transported to the leaves by the xylem in the roots, trunk and branches. The leaves take in carbon dioxide through the stomata and the chloroplasts , using energy from the sun, convert the nutrients into carbohydrates , which are then transported throughout the tree by the phloem. In future columns, I will describe in greater detail, the function of these various parts. 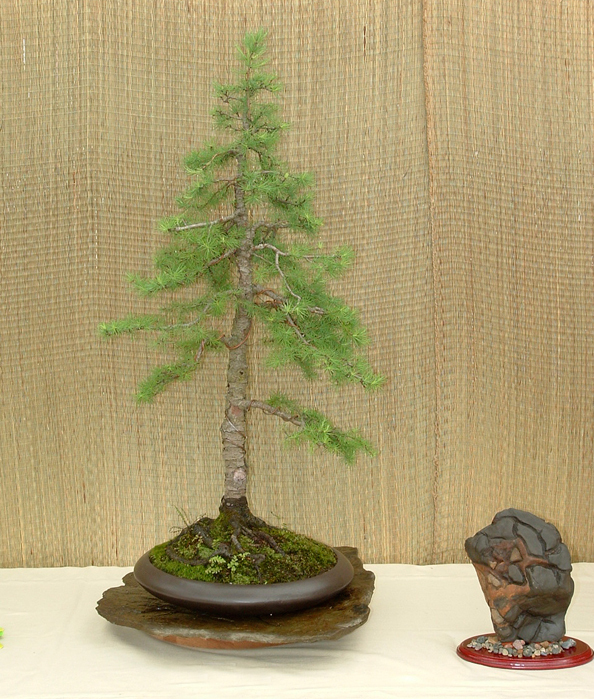 In knowing the physiology of a tree we are better able to understand how to care for and maintain our bonsai.